A 1972 graduate of Kansas State University, Dr. Mike Paul has forty years of experience in companion animal practice (30 of which have been spent in California), organized veterinary medicine, and not-for-profit organization leadership as well as corporate veterinary medicine. From 1999-2000, Dr. Paul was the president of the American Animal Hospital Association (AAHA) and has chaired and participated in numerous task forces for AAHA, the American Veterinary Medical Association (AVMA) and the California Veterinary Medical Association. Dr. Paul is also a founding member of NCVEI and the Companion Animal Parasite Council (CAPC) and was formerly the Executive Director and CEO of CAPC. 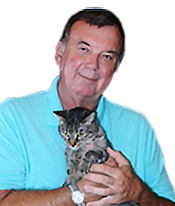 Over the years, Dr. Paul has authored numerous columns, editorials, and articles on vaccine and parasite control matters for veterinarians and pet owners, and he has given numerous presentations at national and international programs on vaccinology, parasitology issues, pet-owner compliance, and consumer experiences. Besides their love for animals, Dr. Paul and his wife Georgia (also a veterinarian) love to travel and have been to nearly 50 countries. Currently, Dr. Paul lives in Anguilla in the British West Indies with Georgia and his two cats Ritz and Mobie. Mike and his wife have a concierge veterinary practice in Anguilla. Their practice focuses on preventive pet healthcare and services island visitors. The practice is Pelican Mobile PetCare. The web site is www.pelicanpetcare.com.